1. How do I register for a course? You may register online by searching for your course using the course search box near the top or by clicking on the link Courses. You have the option to click on the course title for more information or press the Enroll in Course button to the right of the course title if you are ready to add the course to your registration form. Follow the prompts to enter your payment and contact information. A confirmation will be emailed to you, and a receipt will be included with your course materials. Receipts are also available to print from your My Courses account. You may also register over the phone by calling 1-800-793-6533 or by downloading our Registration Form and mailing it in with your check payment via the mail. ULV Student IDs are generated within 1-2 business days and sent to the email address you provided on your registration. 2. May I register for more than one course at a time? You may register for up to 15 semester credits at any time during a semester. You have up to one full year to complete your coursework. You do not need to complete these courses prior to registering for additional credits during subsequent semesters. 3. Do you allow course refunds or exchanges? We do not allow refunds or exchanges. This is a policy you must acknowledge before placing your registration. District and state requirements change regularly. Prior to enrollment, it is important to verify with your district or state that our courses will be accepted. We are available to address any questions or concerns about our courses, and we strongly encourage students to request course syllabi prior to registration. 4. Can I register early for a semester? No, we do not offer early registration. The semester that will appear on your transcript is based on the date you register for your course, not the date you complete your course. For example, if you register on May 31, you will be registered during the Spring Semester. 5. What is the cost of a course, and does this cost include all books and materials? The course cost is $125.00 per semester credit. This cost includes all the books and/or DVDs. Some art courses may require minimal supplies such as art paper, paint, pencils, camera, etc. Technology courses require access to the appropriate software (i.e. Microsoft Office 2013) to complete assignments. 6. How can I receive more information about a course? You may download a detailed course syllabus instantly within each course description. Click here for more detailed instructions. Note: In order to provide the most relevant and up-to-date information, professors have the discretion to change and amend assignments at any time. 7. 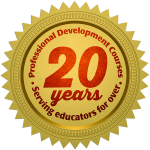 Are the University of La Verne Professional Development Courses graduate level? Yes! Completion of our courses earns graduate, non-degree, semester credit. 8. Is the University of La Verne accredited? Yes! The University of La Verne is accredited by the Western Association of Schools and Colleges. Click here for more information. 9. What is the difference between the PDF format and the online format? For many of our courses, you may select from two convenient formats: PDF or online. PDF format: All of our courses are available in the PDF format, in which course assignments are delivered within one business day via email. Books and, or DVDs will arrive via 2-day priority mail. Assignments can either be printed out to complete, or you can simply type up your answers and projects in a separate Word document. Questions do not need to be re-typed. Completed PDF format courses are uploaded electronically for grading through your My Courses profile. Online format: Courses enrolled in the online format allow students to work on their assignments directly within their My Courses profile. The online format is easy to use and allows students to go back into their course at any time to view and/or print completed work for their record. Books and, or DVDs will arrive via 2-day priority mail. To view all our online course options, click here. 10. How do I access the My Courses account? To access your My Courses account, click on the green tab titled, My Courses & MyLaVerne. Enter your 8-digit ULV Student ID into the Student ID field within the orange Welcome to My Courses! section. If you do not remember your 8-digit Student ID or PIN, please call our office. Remember, if you changed your PIN for MyLaVerne, it does NOT affect your PIN for My Courses. ULV Student IDs are generated within 1-2 business days and sent to the email address you provided on your registration. If you are a new student, and you enrolled in the PDF format only, you will create a My Courses account. To create your account, visit the My Courses & MyLaVerne tab and scroll to the bottom of the page. Enter your Name, Student ID, and Email into the blue box. Once created, you will access your course from the orange Welcome to My Courses! section. 11. How long does it take to complete a course? Courses are designed to take approximately 15 hours per semester credit or 45 hours worth of work to complete a 3-credit course. However, all of our courses are self-paced and independent study. Students have up to one full year to complete their coursework. 12. Is there a time limit for how soon I can submit my courses for grading? Courses can be submitted for grading 10 days from your registration date for your first course, and 7 days for each additional course. This means if you registered for 5 courses, you may submit the first course at 10 days, the second course at 17 days, the third course at 24 days, the fourth course at 31 days, and the fifth course at 38 days. However, once you are past 38 days, you will not have to wait before submitting your additional courses. Important! If you are a brand new student, it will take 1-2 business days for your student ID to be generated. The timelines above begin once you have received your student ID. 13. I need help with my course. May I speak with a professor? Yes! You may ask course-specific questions through Live Chat or through our Contact Us page. Live Chat: Click the Live Chat icon located on any page of our website and select Professor. Contact Us: Click this link located at the bottom of our website and select the subject heading “Assignment specific question about a course I am working on.” Emails sent through the Contact Us page are responded to within one business day. 14. May I view my grades online? Yes. Click the link My Courses & MyLaVerne located on the top of our website, and then click into the red section titled MyLaVerne Online Access to Grades, Transcript, and More! to access the MyLaVerne portal. Your User ID is your 8-digit ULV Student ID. If this is your first time logging in, your initial PIN (password) will be your 6-digit birth date (MMDDYY), not your online course password. Once your account has been accessed, you will select Student Services and Financial Aid, next click on Student Records, and then your grades are posted to your Unofficial Transcript. You may also request an official transcript to be mailed to you by clicking the Order Official Transcript link. 15. When will my course be graded and the grade recorded? Your course should be graded within 5 business days from the date your completed course is received at our university. Students will receive an email notification stating that the course has been graded. Your grade should be posted to your MyLaVerne account within an additional 5-10 business days from the date completed coursework has been graded. 16. When will an official transcript be available? You may request an official transcript once your grades have been posted. Transcript requests can be placed online through your MyLaVerne account, or you may make your request by mail by clicking on the Transcript Requests link from the top of our website. Transcript requests will not be accepted by fax or email. Note: transcript requests received by mail will add 5-7 days to the processing time. 17. What is the status of my official transcript request? Transcript requests ordered online can be checked by logging into your MyLaVerne account. Once you are successfully logged in, click on Student Services and Financial Aid, next click on Student Records, and finally click on Order Official Transcript. The transcript status box is located within this section. Students may contact our Registrar’s Office directly to check on the status of a mailed request form: 1-800-695-4858. 18. Will I receive loan deferment if I enroll in these courses? No, Professional Development Courses from the University of La Verne will not qualify for loan deferment. 19. Where is my IRS Form 1098-T? Professional Development Courses do not qualify for Form 1098-T because these graduate-level, non-degree, semester credit courses are not applicable towards a degree. Students are encouraged to keep copies of their receipts. If you no longer have your receipt, you may download your receipt by the year or by date from the top of your My Courses account. You may also request a copy through our Contact Page located in the footer section of our website, or you may contact us through our Live Chat. 20. How can I get a duplicate copy of my receipts? If you no longer have your receipt, you may download and print your receipt by the year or by date from the top of your My Courses account. You may also request a copy through our Contact Page located in the footer section of our website, or you may contact us through our Live Chat.